Alice Cooper: The Original Shock Rocker Lady Gaga has built a reputation for flamboyant stage shows, but she could probably learn a lesson or two from one of the pioneers of theatrical rock. 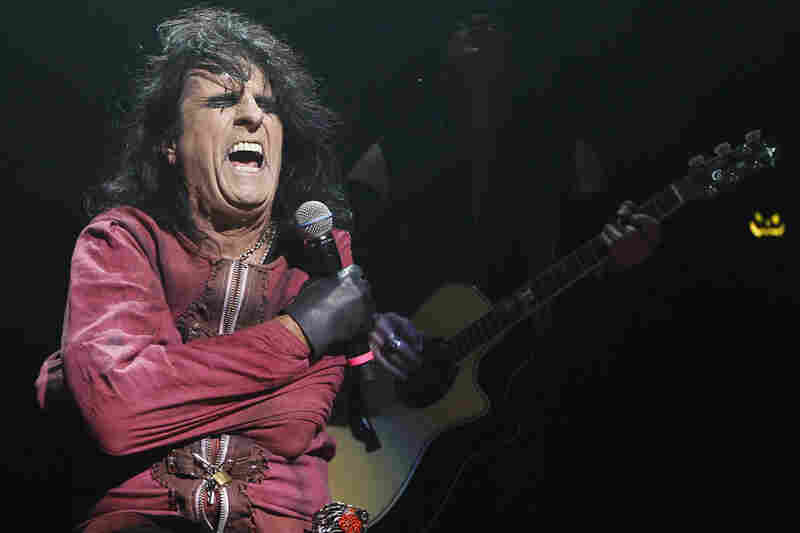 Alice Cooper has left a trail of blood, severed heads and boa constrictors on his way to the Rock and Roll Hall of Fame. 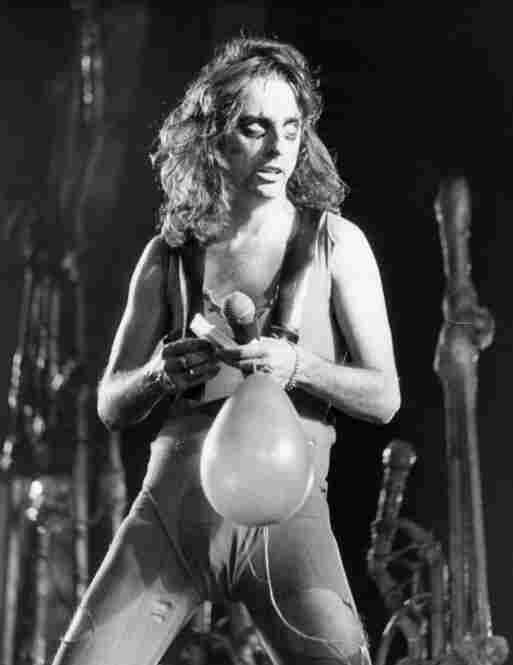 The son of a preacher, shock rock superstar Alice Cooper is part of the class of 2011 Rock and Roll Hall of Fame inductees. Born in 1948, Cooper (originally named Vincent Furnier) was raised in Phoenix. 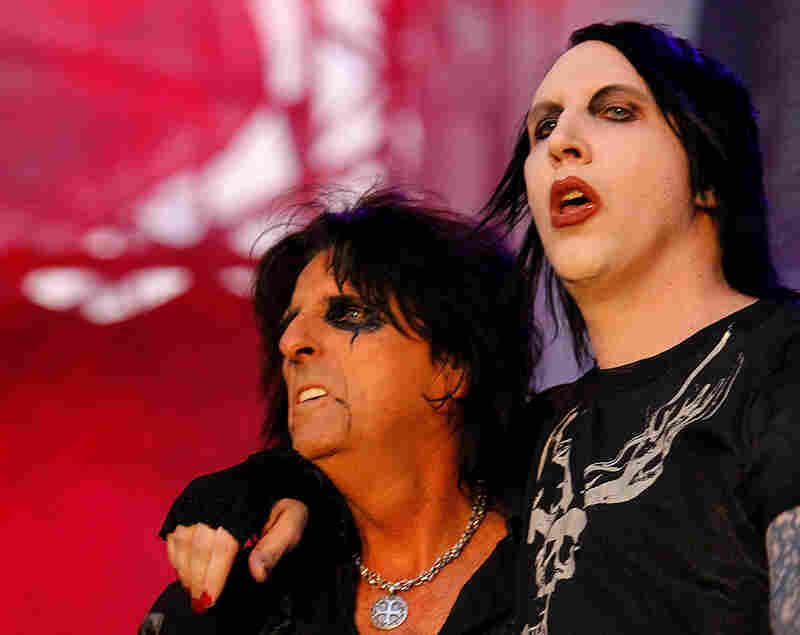 Inspired by his high school band, Alice Cooper formed in the mid-1960s. 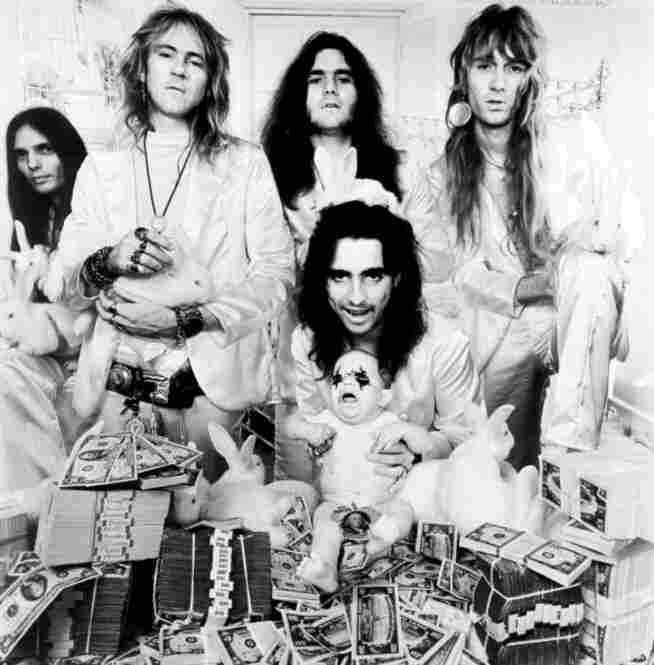 The Alice Cooper band went against the grain, creating a persona of "the rock villain"; by 1971, the group had a record deal with Warner Bros. Records and a top-selling album called Love it to Death. After years of success, band members started to break off, jump-starting their own solo careers. Cooper followed suit, going solo in 1975. His first album, Welcome to My Nightmare, marked his permanent break from the band. Cooper is seen here in a 1975 performance at Wembley Arena. Although struggling with alcohol addiction through the rest of the '70s and early 1980s, Cooper continued to release hit albums and groundbreaking music videos. But after being rehospitalized in 1983 for alcoholism, he sobered up and released four more albums by the end of the '80s. 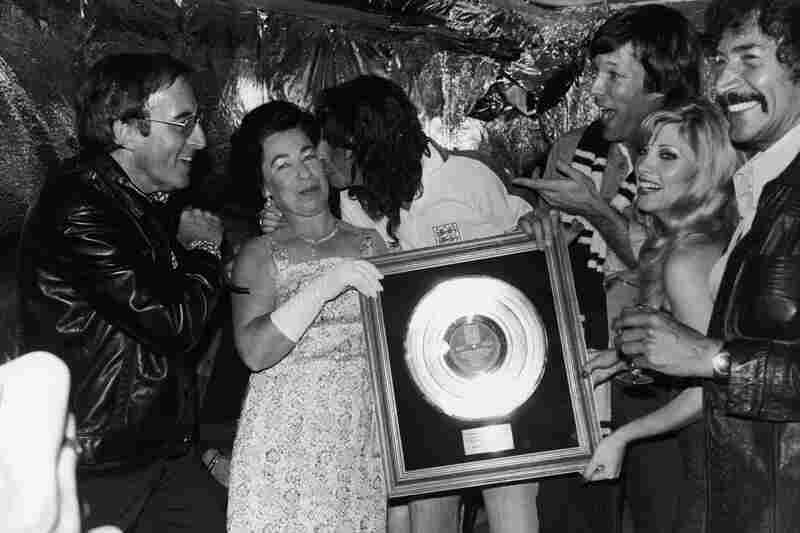 Here, Cooper kisses a Queen Elizabeth II impersonator while holding his gold record plaque, in 1975. By the turn of the 21st century, Cooper was a household name and rock legend as he continued to tour and release albums. He is pictured performing his "Halloween Night of Fear" show at The Roundhouse in North London in 2010.
Cooper touches his star, which was installed on the Hollywood Walk of Fame in 2003 in Los Angeles. An avid golfer, Cooper regularly plays in tournaments and has cited the sport as having a big influence on his life, helping him overcome his alcoholism. 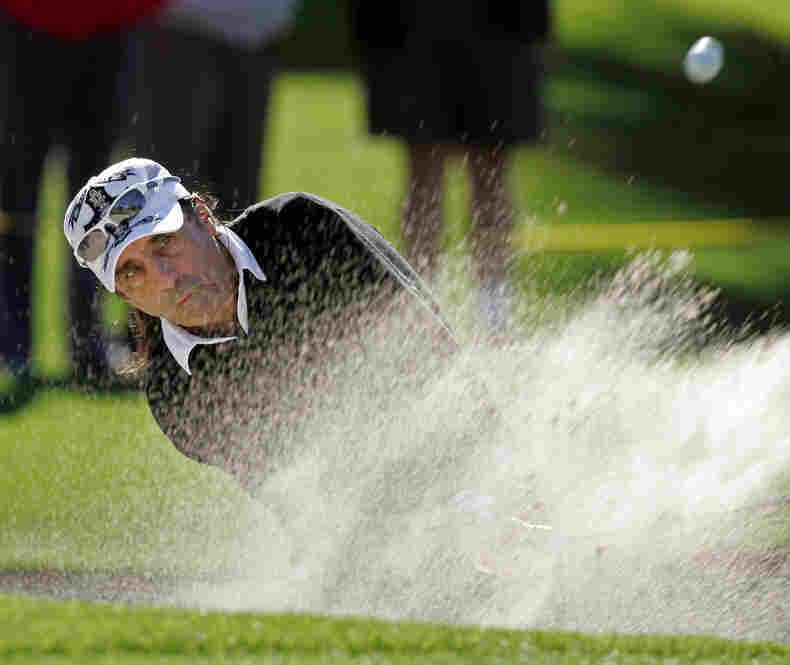 Here, he blasts out of a bunker on the 10th hole during the second round of the Bob Hope Chrysler Classic golf tournament in 2008. Marilyn Manson (right) performs with Cooper during a concert in Bucharest, Romania. Cooper's gory and scandalous stage act became fodder for later shock rockers like Manson and Rob Zombie. 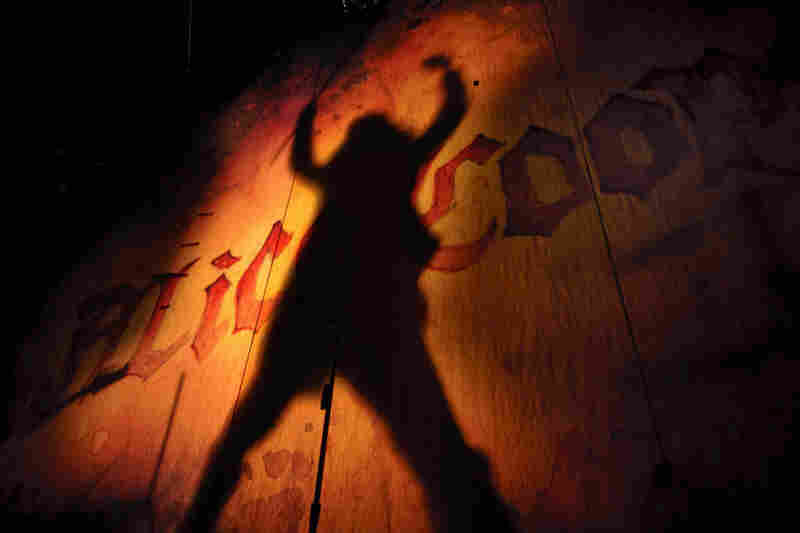 Cooper is silhouetted against the backdrop of the Auditorium Stravinski stage during his performance at the Montreux Jazz Festival in 2009. In March, five new performers will be inducted into the Rock and Roll Hall of Fame. It's an eclectic group of selections, ranging from New Orleans funk giant Dr. John to gravel-voiced skid-row balladeer Tom Waits. But in spite of their differences, each of these singers adopted a special identity or image to stand out from the rest of the pack. Over the next several weeks, Morning Edition will look behind the stage personas of this year's inductees. Vince Furnier's first stage costume was a Beatles wig. He and some buddies from the Cortez High School cross-country team in Phoenix entered a talent show in 1964, doing their impression of the Fab Four. They went over so well that they cut a record the following year. They called themselves the Spiders, and Furnier says they really took their stage image seriously. "There was a giant web behind us. We wore all black," Furnier says. "We didn't just show up and stand up on stage, we appeared on stage." And that became a key to the band's success. They headed for Los Angeles and a name change. "That was the point where I said, 'Let's not be obvious. Let's not call ourselves the Tarantulas. Let's go the other way. Let's go for something that sounds like a little old lady," Furnier says. "I said, 'Alice Cooper,' and that just kind of stuck." The band found that the more confusing their image was, the more gigs they got. Vince Furnier dressed his little old lady character in black leather pants. He borrowed his girlfriend's slip and threw some stage blood on it. "And people would look at it and go, 'What the hell is that?' 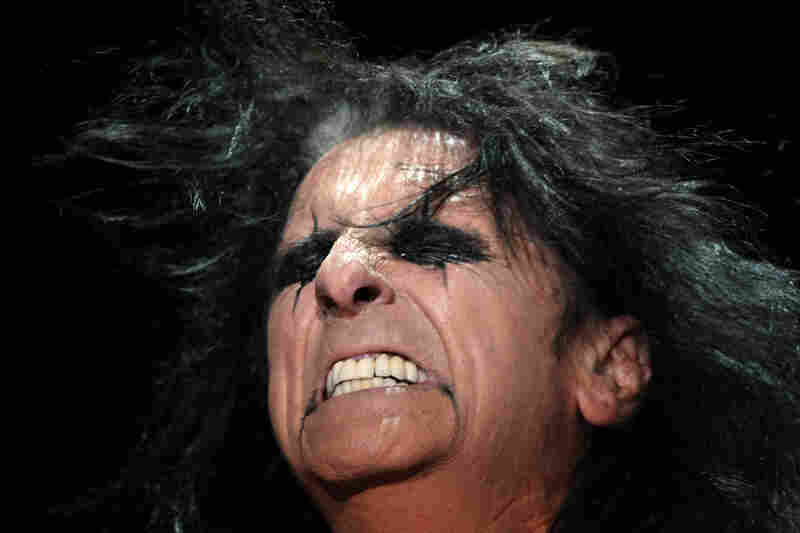 " says Furnier, now more popularly known as Alice Cooper. Critics had the same reaction to the Alice Cooper band's first album, Pretties for You, which was released in 1969 on Frank Zappa's Straight Records label. Zappa saw Alice Cooper as a bizarre comedy act, but the band's first two albums tanked. Then, producer Bob Ezrin came in and took a song that was originally called "I'm Edgy" and turned it into the commercial pop hit "I'm Eighteen." "He kept dumbing it down until it was a three-minute anthem for every kid that was 18 and an outcast," Cooper says. The band kept building its image, staging theatrical concerts, which generally involved the character of Alice being executed, via hanging, electrocution or a guillotine. Once, he brought a live boa constrictor on stage. Rumors circulated that he bit the heads off of chickens, but Cooper insists they were just that: urban myths. Nevertheless, when Zappa got wind of the stories, he asked Cooper if they were true. Cooper denied them, to which Zappa responded, "Don't tell anyone else that," Cooper says. A key to his persona has always been a sense of humor. Cooper appeared on The Muppet Show, and in a Staples commercial, playing a father shopping with a sullen daughter for school supplies. "I think the shock value of Alice is over," Cooper says. "I don't think you can shock an audience anymore, really. I mean, Lady Gaga shocking? I don't think so." Cooper knows that "image" is just that, and he's a bit bemused by some of the musicians who have followed in his footsteps. "You get these bands that are, [growls] 'Oh-h-h, we are the Baby Eaters [or] we're the Satan Worshipers' and all this," Cooper says. "And then you meet them offstage and they're going, [meekly] 'Hello, Mister Cooper, this is my mother. She made cookies for you.' "
After all these years, the person behind the lyrics, the black leather and the mascara, is still ... a nice guy.